Thanks to all who came out to support the 5th Annual Run for Doris event. The day was a great success raising nearly $25,000. 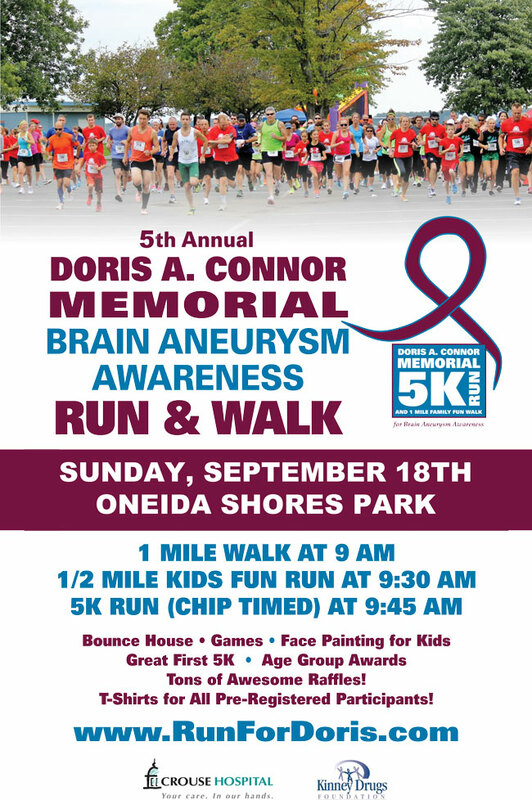 Proceeds will support the Crouse Neuroscience Institute for brain aneurysm research and journal publications, and in honor of Doris, a scholarship will be granted to a Cicero-North Syracuse High School senior who plans to pursue a degree in nursing. Doris Connor was a healthy, active, Registered Nurse who passed away after suffering from a ruptured brain aneurysm at the young age of 59. This was an event for the whole family! We had fantastic raffle prizes, activities for the kids, snacks, and awards for the top runners! Congrats to everyone for your involvement and we look forward to next year’s big day!